Hidden New Jersey: That noisy college town: Somerville? History-minded Rutgers University students (at least the New Brunswick-based ones) quickly learn the facts behind the school's origins. At the behest of officials within the Dutch Reformed Church, Royal Governor William Franklin issued a charter for the creation of Queens College on November 10, 1766, placing it as eighth among the nine colonial colleges. The school got off to a slow start due to various reasons, but eventually began holding classes at a New Brunswick tavern called the Sign of the Red Lion. That's all true, but as we learned on a visit to Hopewell, there's a lot more to the founding of a university. Someone has to come up with the idea in the first place, and in Rutgers' case, that person was Reverend Jacob Hardenbergh of the Dutch Reformed Church. And, it seems, the idea may have come when he was living, not on the Banks of the Old Raritan, but at the Old Dutch Parsonage in Somerville. Not Old Queens... the Old Dutch Parsonage. 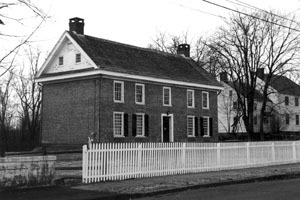 Hardenbergh himself owed a great deal of his education to Reverend John Frelinghuysen, who'd tutored Jacob and other young men at the parsonage in addition to his religious duties. When Frelinghuysen died in 1754, Hardenbergh took his place in the pulpit, and while he didn't tutor students himself, he was a strong advocate for education. The College of New Jersey had been founded 20 years earlier by ministers of the Presbyterian Church's New Light movement, and the Dutch Reformed needed their own academy in which to train future ministers and provide a classical education to others. Hardenbergh traveled to England in 1763 to appeal to King George for a new college, setting the groundwork for what would be chartered as Queens College. By early 1766, he was circulating a petition for the school's creation, and by the end of the year, he'd secured the charter. The establishment of the college was just the first step, and while the Grammar School (now Rutgers Prep) began accepting students in 1767, it took another five years for the upper school to hire a tutor and matriculate students. The first diploma was earned by the class of 1774, Matthew Leidt. Compare that against the more than 14,000 degrees awarded in 2013, and you have to believe that Hardenbergh would be very satisfied with the longevity and productivity of what he worked so hard to start.